Highest point in New Zealand . The Southern Alps are a large and heavily glaciated range which runs the length of the South Island of New Zealand. 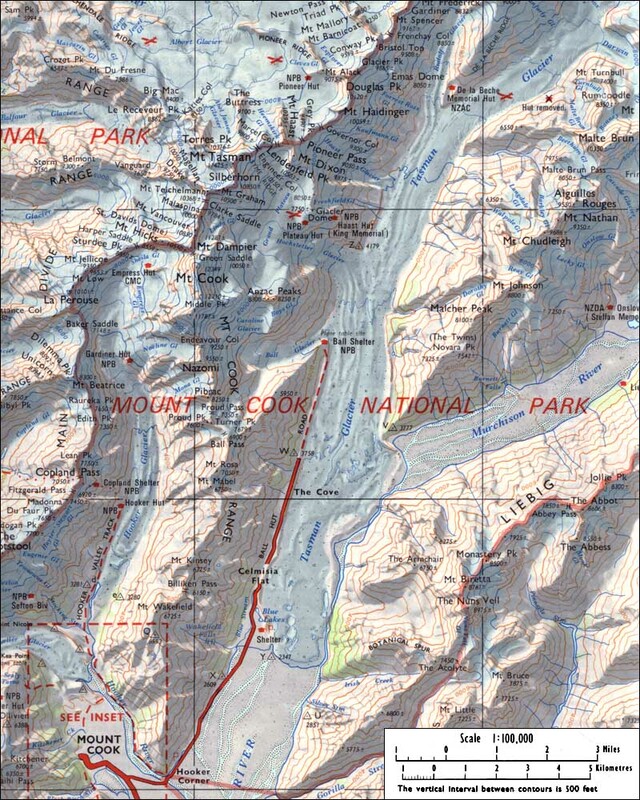 The moist maritime climate and extremely heavy precipitation sustain over 3000 glaciers in the range, the largest of which is the 18 mile (29 km) long Tasman Glacier which flows down the south side of the range to a terminus at 2300 ft (700 m). 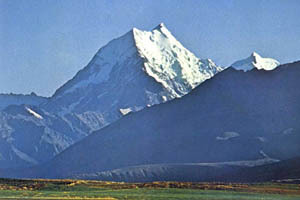 Located just to its west is New Zealand's highest peak, Aoraki (Maori for "the cloud piercer"), also known as Mount Cook. This is a steep and spectacular pyramid of rock and ice, a difficult climb by any route and a dangerous extreme ski descent from the knife-like ice-covered arete which leads to the summit. The summit block collapsed in December 1991, producing a large rock avalanche which ran down the East Face onto the Tasman Glacier over 9000 ft (2700 m) below and reduced the height of Aoraki by 33 ft (10 m), leaving the summit undermined and unstable. 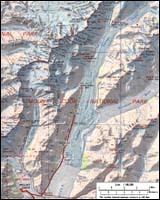 Much safer than the summit area and more popular with ski mountaineers are the neighboring glaciers (including the Tasman and Fox Glaciers), which can be accessed by ski-plane to provide superb runs of many miles in length. Numerous alpine huts through the region provide opportunities for multi-day ski traverses and tours. This is an exceptional area for ski mountaineering, although there is often foul weather at any time of the year.